Alex' Homepage » Finished my PhD!!! 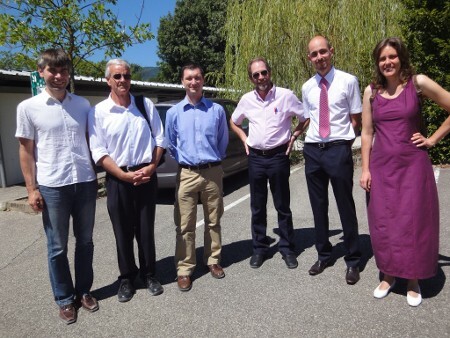 Great news: I finished my PhD studies with a successful defense on July 31! The jury’s critics for my presentation and defense were very positive, and so the jury was happy to award me with the doctor diploma . For people who are interested in my research work on automated human action recognition in realistic video sequences, I invite you to visit my homepage at the LEAR research group. After about 3 years and 8 months of doctoral studies + 8 months for my master studies, approximately 15,000 km of cycling, many ups and downs , a lot of new things that I learned, a deep dive into the French culture, many wonderful people that I met, a great shared flat in Grenoble downtown (! ), many wonderful musicians that I was able to play with (thanks, light motif! ), and a wonderful stay in a really nice city, my time in Grenoble has finally come to an end. Thanks to everybody that I was able to meet and to share a part of my path that led my through Grenoble! Salut Alex!! C’etait un plaisir d’avoir passe un bout de temps avec toi, te souhaite un fabuleux depart dans ta nouvelle boite!